With Autoxloo’s mobile, patented SlingShot™ software, dealers have more control over their inventory. Manage your vehicle inventory any time you need it. With Slingshot Mobile™ you can check vehicle details from just about anywhere. There’s no need to be tied to a desktop PC and confusing software anymore, simply log into the app and upload vehicle details, photos, and even videos. If you value your time and have a mobile device (show me the person who doesn’t), Slingshot Mobile™ is the perfect tool for you. Capture A Complete Car Profile In Less Than 5 Minutes! 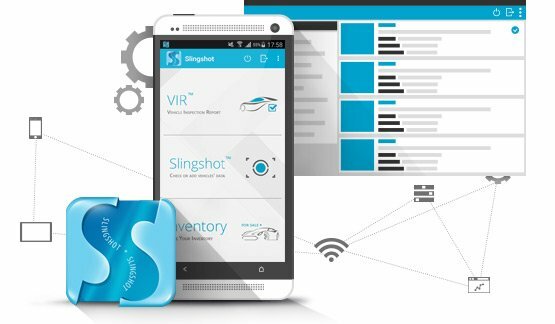 Slingshot Mobile™ works by scanning the VIN, taking a few pictures and navigating point-and-click menu which will describe if a vehicle has been maintained properly. Use our VIN Decoder and capture all relevant information in 5 minutes or less with our VIN explosion capability. A vehicle history are entered in a few easy steps. As you see, the technology behind all of this is transparent. You won’t need an IT degree to quickly capitalize on it’s abilities. Application that can boost productivity and make inventory comparison much easier. Lost Internet connection? Not a problem! You can still upload vehicle data. Your vehicles will have the pending status and will be uploaded automatically when the connection is restored. Enjoy the ability to update your vehicle inventory offline!